What kind of shot was that? Don’t you know how to stop the ball? Plus, how would I have responded if a player answered one of my questions with a sincere or snide remark? “Ryan!” who happened to be the teammate who somehow received the ball by pure chance. “Adam!” who happened to be the nearest teammate in line with the pass even though in order for Adam to receive the ball, it would have had to pass through three defenders. Rarely if ever were the answers truthful. First and foremost, it will eliminate the need to ask the question, “Who was that to?” The player will have answered the question before it was ever asked. If the ball does not go to the intended receiver, the passer will know it without a coach or parent having to bring it to his/her attention. When older players make poor passes, ask them to state why it was a poor pass. For example, “I did not use the inside-of-the-foot” or “I did not look up” are good answers. Speaking of looking up, in order to call out a player’s name, the passer has to look up. Too often, players play with their heads down, don’t see the whole field, and make poor passes. Kickball, which is the act of teams kicking the ball up and down the field with no purpose, will diminish. Long balls will still be kicked, but they will be kicked to a teammate. Over time, the rhetorical questions will lessen and play will improve dramatically. Author’s Note: This post is the final in a series of posts that breaks down the 2010 Soccer MVP Tournament competition. Be sure to look at the final results to review how ‘Inside’ was crowned champion. What do you call this part of the foot? Please vote. Of the six disciplines tested so far in the MVP (most valuable part) tournament–structure, receiving, dribbling, passing, shooting, popularity among professionals–‘Inside’ won five of them. The only discipline it did not win was the ‘Structure’ competition, although it did come in a close second. One discipline remains–Easy of Learning. Given its importance, it would be nice if it was easy to learn to use the inside-of-the-foot. Unfortunately, that is not the case. For this discipline, ‘Inside’ tied for last. The winners were the bottom- and top-of-the-foot. The main reason why ‘Bottom’ and ‘Top’ won this discipline has to do with the way humans walk. Most of us walk with our toes pointing (relatively) straight ahead. Thus, when a ball is passed to a player, it is very natural to simply lift the bottom-of-the-foot off the ground in order to receive it. Equally natural is to use the top-of-the-foot to pass and shoot the ball (although a young player will often use his/her toe when first starting to play soccer). The story is very different for the insides- or outsides-of-the-feet. The reason once again has to do with the way humans walk. Receiving the ball with the inside-of-the-foot is not natural. To control the ball properly, the receiving foot needs to have the hip turned out slightly, the knee even more, and the ankle turned a full 90-degrees in relation to the ball. To pass or shoot the ball with the inside-of-the-foot is even more uncomfortable and unnatural. I’m guessing a ballerina would have an easy time learning and feeling comfortable using her ‘Inside’ but not a young player. Just like the inter-locking golf grip takes a while to get used to, so too does using the inside-of-the-foot. The same difficulty and uncomfortable feeling exists when using the outside-of-the-foot. … are the two biggest problems in youth soccer today. These issues are preventing players from reaching their full-playing potential. I watched the USA vs. Netherlands game today. The U.S. did not do too well (granted several likely World Cup starters did not play and the U.S. was playing the team ranked third in the world). Though the scoring chances did not reflect it, the first half was dominated by the Dutch. Jonathan Bornstein gave up a silly penalty and was lucky not to be called for a second one when he unintentionally handled the ball in the penalty area. The 0-1 was a just half-time score although if you look at the statistics I compiled (more on those shortly), the U.S. was lucky to be down only one goal. In the second half, the U.S. showed more urgency but so too did the Dutch. The U.S. was very unlucky in conceding the second goal but made up for it with a beautiful header by Carlos Bocanegra. 23-year-old Dutchman Eljero Elia sure is a good player. He was all over the field today. The U.S. was fortunate to lose by only one goal. The statistics I referred to earlier are shown below. 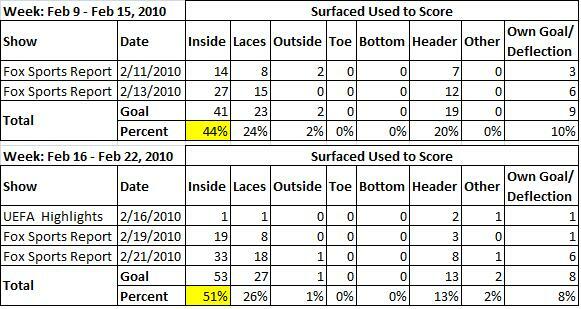 They are the same type of touch-statistics I compiled for the 2010 MVP tournament for which the inside-of-the-foot was crowned champion (MVP stands for most-value-part). The Dutch completely dominated the first half in terms of touches (see below). They more than doubled the number of U.S. touches: 769 (71%) – 317 (29%). When looking strictly at feet touches, the percentages are even higher (see yellow cells). I contend that controlling the ball with the feet gives players more control than with other parts of the body. I also contend that using the inside-of-the-foot to control a ball, whether it is to receive, pass, or shoot, gives players far more control of the ball than other parts-of-the-foot. While both the U.S. and Dutch used the inside-of-the-foot a majority of the time (see yellow cells), the Dutch did so with much more frequency. I’m not sure if these statistics prove anything (I did not compile statistics for the 2nd half because it takes a long time to do so and I wanted to get this post published in a timely manner). However, today the Dutch were the dominant team and they did exhibit very good ball control. I believe that poor ball control and a lack of emphasis placed on using the inside-of-the foot are the biggest problems facing U.S. youth soccer. If you concur and believe that the inside-of-the-foot is soccer’s MVP, please join the “Inside-of-the-Foot Soccer Fan Club” on Facebook. I watched the game on ESPN2. I only counted touches that were televised. If I could not tell which body part or surface was used, I did not count the touch (this included when more than one player was playing the ball). If there was a one-touch pass, it was counted only as a pass, not a reception (under receiving). Headers were counted as passes when the intention was there. Otherwise, headers fell under ‘receiving’. Author’s Note: This post is one in a series of posts that breaks down the 2010 Soccer MVP Tournament competition. Be sure to look at the final results to review how ‘Inside’ was crowned champion. What do you call this part of the foot? Please vote. There is an old expression that goes, ‘When in Rome, do as the Romans do.” Today people usually use this expression when asked how one should be behave when visiting a foreign country or visiting someone’s house. Basically, you won’t go wrong if you follow the lead of the locals or homeowner, respectively. This expression holds true in soccer as well. When playing soccer, if a player emulates his/her favorite professional player or team, chances are he/she will become a pretty good soccer player. 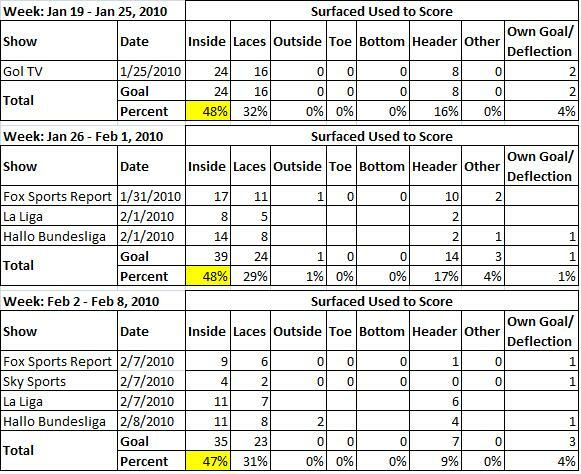 With that said, ‘Inside’ is by far and away professional players’ most used surface and easily won the ‘Popularity Among Professionals’ discipline (see table below). ‘Inside’ won both competitions that were used to measure popularity. The first competition counted the number of touches that took place in one half of an English Premium League game. The second competition examined the number of goals that were scored over a month in professional leagues across the world. For this competition, I broke down only the first half the Chelsea vs. Arsenal game that was played February 7, 2010. The touches were broken down by the four main disciplines already examined in this competition. They were receiving, dribbling, passing, and shooting. For each discipline I examined which foot surface was used to perform the skill. They are inside, outside (laces), outside, and bottom. The table also includes touches made with the thighs, chest, and head. I only counted the touches that were shown on TV. On 50-50 balls or when the ball ricocheted off player like a pinball , I did not count those touches. It was easy to differentiate between inside touches and all other touches. It was harder to differentiate between a top (laces) and outside touches, especially when dribbling. I categorized all headers under ‘receiving’ unless they were shots on goal. Even with dribbling, ‘Inside’ was the most popular surface, 41% and 44%, respectively. In this game, ‘Laces’ was the most popular surface. However in the goal-scoring competition below, you will find a surprising but clear winner. For a five-week period, I looked at all the goals shown on the major soccer highlight shows including Fox Sports Report, Gol TV, La Liga, Sky Sports, and Hallo Bundesliga. I usually looked at several shows a week. When the same goal was shown on multiple shows, the goal was only counted once. In addition, if it was not clear what surface was used to score, the goal was not counted. The other disciplines evaluated in this competition were: structure, receiving, dribbling, passing, shooting, and ease of learning. A lot of young players today rely on only one foot to do all the work. Oftentimes, I will see young players run around a ball just so they can stop it with their dominant foot. I strongly believe that at a very young age coaches and parents should encourage and work with their players and children to get comfortable using both feet. Much like learning a second language or a musical instrument, it is much easier when a child is young. This can also apply to learning to use both feet. To help in this endeavor, I have created the ‘Magic Cube’. It is soccer’s equivalent to the ‘Magic 8 Ball’. It helps teach and remind a player which foot to use to stop a ball. Light brown represents the side of the body the ball is passed to (pass). Red represents which foot should be used to stop the ball (stop). Blue represents which surface of the foot should be used to stop the ball (side). With the help of the Magic Cube, remembering the proper technique for stopping a ball is simple. When the ball is passed to a player’s left side, he/she should use the inside of the left foot to stop the ball (LIL). When the ball is passed to a player’s right side, he/she should use the inside of the right foot to stop the ball (RIR). When the ball is passed to a player’s left side, he/she should use the outside of the right foot to stop the ball (LOR). When the ball is passed to a player’s right side, he/she should use the outside of the left foot to stop the ball (ROL). Feel free to download and assemble your own Magic Cube. In other posts, I have mentioned fun practice alternatives. Assembling Magic Cubes would certainly qualify as a fun practice alternative. All you need to bring to practice are some 2-dimensional cubes and a few glue sticks (depending on the age of the kids, the cubes may need to be pre-cut and scored). Once the cubes have been assembled, demonstrate the proper stopping technique. Young players will remember the sage wisdom of the Magic Cube for a long time. During the year, coaches and parents can always refer to the ‘Magic Cube’ when the players need some assistance. I added dots to each face of the cube so the Magic Cube can also be used as a die. If a player uses the Magic Cube more than once, its message will have a better chance of sinking in. 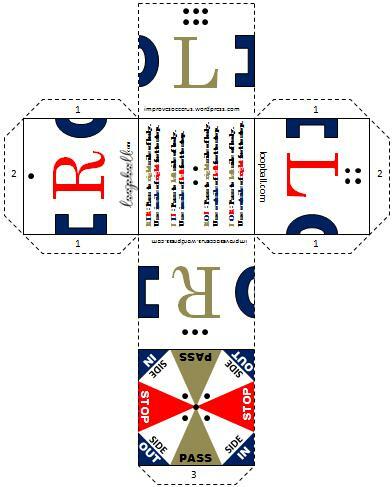 To open and print out the Magic Cube shown above (complete with instructions), click here. To check out Magic Cubes in several color schemes, click here. Choose your favorite. I will also be happy to create a custom-colored Magic Cube. Just let me know. The sooner a young player feels comfortable using both feet, the better. There sure is a lot of emphasis placed on shooting and scoring goals. And rightfully so. After all, if you don’t shoot, you don’t score, and if you don’t score, you don’t win games. Goals in soccer are equivalent to home runs in baseball, touchdowns in football, and slam dunks or buzzer-beating shots in basketball. It’s what puts bodies in the stands and highlights on Fox Sports Report, Gol TV, and ESPN SportsCenter. The lack of goals is usually the #1 complaint voiced among sports fan when asked what’s wrong with soccer. So players, please shoot, shoot often, and score! The shooting discipline was divided into 3 categories: power, accuracy, and breadth. In what many will consider an upset, ‘Inside’ won this discipline as well. Without a doubt, ‘Laces’ generated the most powerful shots. Besides being able to transfer the momentum of a pass or a cross to produce powerful shots, strong shots were also generated when shots were taken with the ball in a stationary position. ‘Laces’ was able to score some fantastic goals from 25-, 30-, or 35-yards out. Talk about a ‘golazo’. ‘Inside’ came in a respectable second. On crosses, ‘Inside’ generated as much power as ‘Laces’ had. But it was not able to generate as much power from stationary or set-play shots. However, ‘Inside’ was able to score some amazing goals off of free kicks. Walls and great goalies were no match for a beautifully executed and well-positioned ‘banana kick’. On several occasions, ‘Outside’ was able to generate the same velocity as ‘Inside’ had but only rarely. ‘Bottom’ was a non-factor. ‘Inside’ excelled at accuracy. The same billiard table analogy I used for receiving the ball can again be applied. The flatter the surface, the more accurate the shot. On many crosses, ‘Inside’ simply had to stick out the foot and accurately redirect the ball into the net. 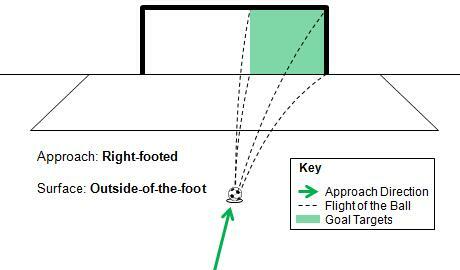 Accuracy is why penalty kicks and free kicks are taken with the inside-of-the-foot. A good penalty taker has to be able to hit any target inside the goal. With the inside-of-the-foot, the lower-left corner can be hit just as easily as the upper-right corner. The same holds true for direct free kicks. When David ‘Bend-It-Like’ Beckham shoots his free kicks, he always uses the inside-of-the-foot. ‘Outside’ came in second because it was more able to consistently hit its targets than ‘Laces’. When ‘Laces’ made solid contact with the ball, it would usually go straight. However, when the ball did not make solid contact with the sweet spot on top-of-the foot, a spin or curve was introduced and the direction of the shot became more unpredictable. ‘Bottom’ was once again a non-factor. Goalies are so good these days that it often takes incredibly precise shots to beat them. To be effective goal scorers, players need a foot surface that can give them many shooting options. The inside-of-the-foot does this and easily won this shooting subcategory. Several ‘breadth’ tests were used in determine the winner: penalty kicks and long-distance shots with defenders in the way. Penalty takers try to disguise the direction of the penalty kick so the goalie is forced to guess where the ball will be kicked. Good goalies know that the position of the plant and the kicker’s approach usually telegraph the placement of the kick. That is not the case with the inside-of-the-foot. 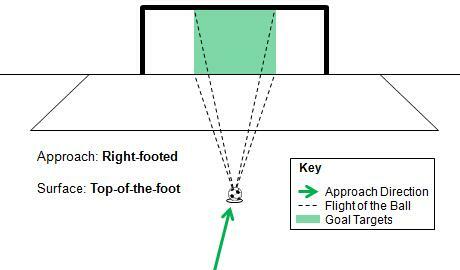 Good penalty takers are able to place the plant foot in several positions and still hit all targets inside the goal (see image below). The same is not true when using the top- or outside-of-the-foot. As illustrated below, these surfaces limit the part of the goal that can be targeted because the plant foot needs to be positioned just so in order to execute a good kick. Therefore, good goalies can usually predict where the ball will be kicked by concentrating on the position of the plant foot. Bending the ball around defenders is an extremely important skill for forwards and free-kicker takers to have. Once again, David Beckham is able to bend or curve a shot around or over walls that are set up to defend against the free kick. This skill also comes in handy on non-set plays. When a forward needs to avoid a defender from blocking a shot, a curved shot using the inside-of-the-foot will do the trick. Even when no defenders are present, forwards will curve a shot around a goalie’s outstretched hands. Shots with the top-of-the-foot generally go straight. If a defender is standing between the shooter and the goal, whether in a wall or in the run of play, there is a high percentage that the shot will be blocked. Shots with the outside-of-the-foot did give the kicker the ability to curve the ball around a defender, but unlike the inside, these shots had less spin. In a surprise, ‘Inside’ won the shooting discipline. In terms of shooting ‘accuracy’ and ‘breadth of shots’, the inside-of-the-foot was the overwhelming winner. ‘Inside’ also did quite well in the ‘power’ category. The other disciplines evaluated in this competition were: structure, receiving, dribbling, passing, popularity among professionals, and ease of learning. Personally, I am a big fan of the pass. It probably stems from having played midfield most of my life where controlling the game and distributing the ball were this position’s primary purpose. When I watch games today, I prefer seeing a nice assist rather than a nice goal. When passes are made correctly, they look easy and effortless. They are anything but. Passing requires a player to first control a ball that is passed to him/her. Once the ball has been successfully controlled, he/she must know if and where to pass it. This requires playing with the head up (in an up position) in order to see all the players and be able to judge the speed and direction teammates are moving. Most importantly, it requires maturity, confidence, and knowledge of the game. While it is never too early to introduce and teach passing, it is a discipline that won’t become refined and polished until a player is older or has played for many years. The passing discipline was divided into two categories: accuracy and types. For both categories, ‘Inside’ was the clear winner. ‘Types’ refers to the number of different types of passes that can be made with a surface. The structure of the inside-of-the-foot is built for accurate passing. The flatter the surface, the more accurate the pass. There is a reason why a tennis racket, a ping pong paddle, and a putter are flat. Imagine trying to hit a tennis ball back over the net using a baseball bat. 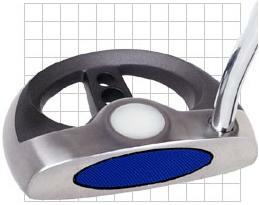 Or how about putting with the rounded, back end of the putter (see image to the right). In both instances, the required task would become more difficult. Another factor which contributed to ‘Inside’ having the highest levels of accuracy is the swinging motion of the leg when the ball is passed. When striking the ball with the ankle sweet spot of the inside of the foot (larger red spot in the image to the right), the leg swing should be in a straight plane. It is very much like a golf putt. Ideally, the leg swings straight back and then swings straight through the ball. The straighter the overall swing, the more accurate passes a player will make (green arrow in the image below). Typically, when passing the ball with the front sweet spot of the inside-of-the-foot (smaller red spot in the image above), the laces, or the outside-of-the-foot, the plane of the swing is more angled. Passes with these surfaces are similar to full iron or wood/metal shots in golf. This angled stroke plane introduces more variables to the swing and, therefore, a higher probability for inaccurate passes (red arrow in the image above). The top-of-the-foot was the next most accurate surface. 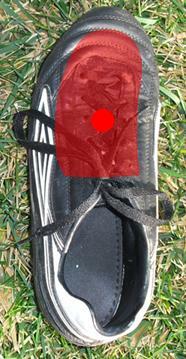 To make an accurate pass, the ball had to be struck with the foot’s sweet spot (red spot in the image to the right). Unlike with the ‘Inside’, a pass with the laces required more of an arcing back swing which took away some of the accuracy. An ‘Outside’ pass has a similar arcing swing but this surface is also striking the ball with a convex surface, making it more difficult to control a pass. Passes with the bottom-of-the-foot were accurate but the distances achieved with this surface were short. It came in last place. Being able to accurately pass a ball to a teammate in a straight line is invaluable. But being limited to only this type of pass is not ideal either. Oftentimes, a defender will stand between a passer and receiver. Except for the bottom-of-the-foot, a player can pass the ball over a defender using other surfaces of the foot. There are times, however, when this may not be possible, especially when the defender is close to the passer. This is where ‘Inside’ has a distinct advantage over the other surfaces. When the front sweet spot on the inside-of-the-foot is used to pass a ball, it will cause the ball to curve or spin. The technique can be used to curve a pass around a defender. This makes ‘Inside’ the only surface which gives a player 2 distinct options when passing the ball. 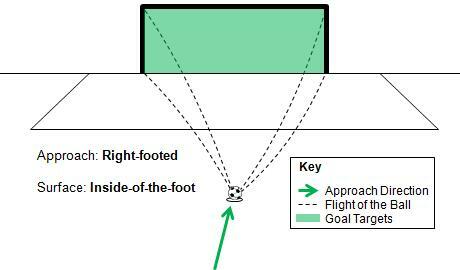 Most indirect free kicks are kicked with the inside-of-the-foot to deposit the ball precisely to the receiver’s foot or head. David ‘Bend It Like’ Beckman is world-renowned for his precision free kicks and passes. The ‘passing’ discipline results were not close. In terms of passing accuracy and the different types of passes that can be made, ‘Inside’ was the easy winner. The other disciplines evaluated in this competition were: structure, receiving, dribbling, shooting, popularity among professionals, and ease of learning. Working on these skills in practice, at home, incorporating them into small-sided practice games, and executing them in real games are making our youth players much more creative. This is fantastic! For this discipline, dribbling was broken down into two categories: speed and moves. ‘Laces’ was the overwhelming winner for speed, with ‘Inside’ and ‘Outside’ sharing second place. When it came to moves, which consisted of fakes and feints to get around an opponent, ‘Inside’ and ‘Outside’ shared the top spot. There are two types of speed in soccer: speed off the ball and speed with the ball. The fastest players on a team should be the fastest players off the ball. However, the fastest players are not always the fastest dribblers. Proper dribbling technique plays a huge part in the overall speed of a dribbler. Good running form requires that the toes are always pointing in the direction the player is running in. To achieve optimal dribbling speed, a player should deviate his/her running form as little as possible. The easiest way to accomplish this while controlling the ball is to use the top-of-the-foot. Touching the ball with the top-of-the-foot requires only the slightest change in form. When done probably, only very little speed has to be lost. The toe could also be used to touch the ball when speed is critical. In fact, using the toe to dribble deviates even less than using the top-of-the-foot. However, because the toe surface is rounded, a player will have less ball control when it is touched. The top-of-the-foot is much flatter and provides much more control. Because the angle of the foot has to change when touching a ball with the inside- or outside-of-the-foot, a player’s running form will change and overall speed will be reduced. Playing a ball with the bottom-of-the-foot and sustaining any kind of speed is impossible. Dribbling around a player is best achieved using the inside- or outside-of-the-foot. All of the moves listed above use one of these parts. In fact, you may have noticed that to accomplish these moves, the players used a combination of surfaces to complete the moves. This is typical in order to beat good defenders. Sometimes, the bottom-of-the-foot is incorporated into these moves as well. Rarely is the top-of-the-foot used to get around an opponent. Because of its flat surface and the position of the foot when a ball is played with this part of the foot, the ball will naturally go straight. With an opponent directly in front of a player, this serves no value. However, it is worth mentioning that at full speed, using the toe to poke the ball past a defender is a great move. Since I am lumping the toe together with the top-of-the-foot, ‘Laces’ and ‘Bottom’ share the same score. It turns out that the dribbling discipline was too close to call. Though ‘Inside’ and ‘Outside’ fared very well in both dribbling categories, because ‘Laces’ was such an overwhelming winner in the speed category, all three surfaces took first place. The other disciplines evaluated in this competition were: structure, receiving, passing, shooting, popularity among professionals, and ease of learning.